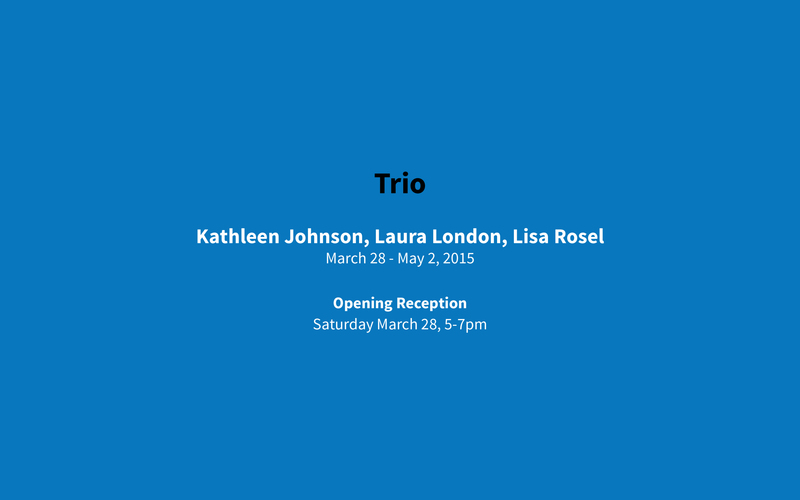 Trio: Kathleen Johnson, Laura London, Lisa Rosel Extended to May 9th! c.nichols project is pleased to announce Trio, a group exhibition of works by three contemporary female photographers: Kathleen Johnson, Laura London, and Lisa Rosel. This show borrows it's title from the iconic 1987 album of the same name which featured compositions by Dolly Parton, Emmylou Harris, and Linda Ronstadt, all of whom maintain harmony while preserving their unique and individual voices. Kathleen Johnson lives and works in Los Angeles. She received her MFA from the University of Southern California, Los Angeles, CA; and her BFA from Otis Art Institute. She has also studied at the Parsons School of Design, Paris. In Spring 2004, Johnson undertook a 15-day residency, or “crew rotation,” at the Mars Desert Research Station (MDRS) in Southern Utah, from which this selection of prints was drawn. Johnson's work dives head first into landscapes of fantasy. Oscillating between the real and imagined, her miraculous worlds are often investigations into the overlooked spaces of everyday life, balancing between the plausible and the incredible; a hallucinatory vision of what might be present in the most ordinary of spaces. Her projects include Another Cats Show, 356mission, Los Angeles; Brainchild Part 2, Human Resources, Los Angeles; Brainchild Part 1a (redux), An evening of sound at ACME, ACME Gallery, Los Angeles; The Grotto, High Desert Test Sites 5 with Taalman Koch Architecture and composer Gregory Lenczycki, Yucca Valley, California; The Minded Swarm, Los Angeles Contemporary Exhibitions; The Grotto, High Desert Test Sites 4 with Linda Taalman, Yucca Valley, California; Mars Desert Research Station residency, Utah, Crew 28, among many others. A comprehensive CV of Ms. Johnson’s work may be viewed here. Laura London is an artist based in Los Angeles, California. Ms. London works within the medium of photography. Her artwork consists of photographs that are shot on film, drum scanned and made into images that are large-scale color and black and white archival exhibition pigment prints. Viewing the work is similar to viewing a film. All of the events taking place in the photographs are set-up and fictional, although at times they can appear to be documentary. Absence/Presence explores issues of identity, youth, and contemporary culture. This body of work examines ideas of contrast and opposites, of film and digital. To quote Holly Myers in the Los Angeles Times review of London’s show at works on paper, inc., the model “wears the costumes not as clothes but as psychological states,” which reflects this time of change in the medium of photography. Ms. London's work has been exhibited at Caren Golden Fine Art, and twice (After School Special and Laura London) at works on paper, inc. in Los Angeles. Group exhibitions include Mind/Map/Los Angeles: The Laurence Rickels Collection organized by Katrine Bruun Jørgensen at the AD&A Museum, UC Santa Barbara, Modern Love: Gifts to the Collection from Heather and Tony Podesta, National Museum of Women in the Arts, Washington, DC, A House Is Not A Home, curated by Beth Rudin Dewoody, Caren Golden Fine Art, NYC. Commissions include: Muse X Editions and Los Angeles Center for Photographic Studies. For more information on Ms. London's work please visit her website here. Lisa Rosel is a Los Angeles based artist who specializes in photography. Her work deals in the intersection of advertising within contemporary and historic representations of female sexuality. Ms. Rosel has been exhibited at venues across Los Angeles (at the Downey Museum of Art, Downey, CA, and at various private spaces). She has mentored under artists such as William Eggleston, John Baldessari, and Robert Rauschenberg. In addition to her practice, Rosel has studied at the School of Visual Arts, New York, NY; the Parsons School of Design, New York, NY; and at Art Center College of Design in Pasadena, California. According to Juri Koll, “Lisa Rosel has activated her art as part of her travels throughout Los Angeles and it’s environs, as she chances upon, and then captures her prey – unsuspecting billboards, signs, ads – in their environment, their territory. All are indicators of the public aesthetic – at least, the sense perception that the powers behind the images want us to believe.” c.nichols project is presenting three new photographs from Ms. Rosel that are taken in the pop cultured two-block Sunset Strip at the Chateau Marmont. For more information on Ms. Rosel's work please visit her website here. For press inquiries: Please contact Christine Nichols or Justin Cavin at info@cnicholsproject.com.